We made it over to the Shanghai Grand Prix again yesterday for some F1 action, but the weather was most definitely not on our side. We'll put it this way, we got wet. Spoilers below. The race began with a bit of caution, as the group tailed the AMG-supplied SL63 pace car for eight laps before being let loose to the elements. Red Bull Racing's Sebastian Vettel took the pole during Saturday's qualifying session, holding onto the position until today's rain soaked finish. 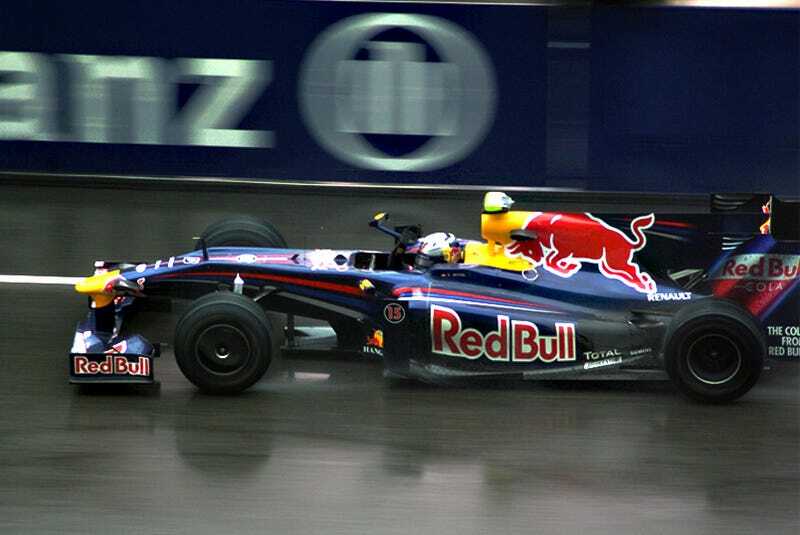 Not only did Red Bull pull a 1st place podium finish, but team mate, Mark Webber also pulled it in, giving Red Bull Racing a one-two finish over the rest of the pack. It was a rather uneventful grand prix, with no real racing taking place except for a few fun laps with McLaren's Lewis Hamilton and Ferrari's Felipe Massa. Series leader, Jenson Button and his Brawn Honda/Mercedes, played hard, but was unable to hold onto his winning streak, eventually finishing 3rd. Make sure you check out my coverage of Day 1 and Day 2 for more on track and lifestyle images from the event.